The 'Stone of Praise', helps the being to recognise achievements, ability and positive qualities, of not only the self, but of others too. Topaz is a beautiful stone, it is soothing, healing and lifting in its offerings. It is a stone that feels its keeper and works where it is needed most, at its best. Topaz strives to help its keeper in as many ways as possible; emotionally, physically, mentally or spiritually. This stone sends out a clear message that it is here to love, to help and to heal. In its different forms it does have differing offerings, yet with the same undertones. Imperial Topaz encourages self-praise and the praising of others, where there has been positive achievement, as well as the reaching of goals. This stone also helps to bring recognition of positive qualities and abilities, not only of the self, but also of other beings. Imperial Topaz then encourages such positive qualities and abilities to be praised, brought out into the open and integrated in daily life. A stone that raises confidence and self-esteem, Imperial Topaz can be called upon during times of insecurity and un-certainty. This stone helps to lift the spirit and strengthen willpower. Alongside this, Imperial Topaz can be very helpful in the strengthening of spiritual, physical, mental and emotional health and ability. Also, Imperial Topaz can be a helpful support and strength to those breaking addictions and negative cycles. A stone that also helps release the being from the grip of depression, anxiety and nervousness, as well as being helpful in the easing and prevention of nervous and physical exhaustion. 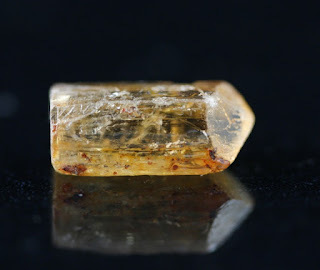 Imperial Topaz aids the function of the body's lymphatic and endocrine system, as well as the function of the kidneys, liver, gallbladder, lungs and heart. This stone also helps in the clearing and prevention of water infections, bladder stones and bladder inflammation. Imperial Topaz encourages the being to be the best they can be, to the best of their ability. Alongside this, Imperial Topaz teaches of boundaries and the importance of not pushing the self to far, past limitations.